Post-tensioned tanks for nuclear and energy storage applications are small radius cylindrical concrete structures. A large pre-compression force must be applied to withstand the high levels of tension produced by the inner pressure and the temperature gradient between the inner and outer faces of the wall (regardless of the inhomogeneous material alteration due to the latter). Hence, high curvature horizontal (circumferential) tendons with a large number of strands, heavily post-tensioned, must be placed with the smallest possible vertical separation. The resultant radial post-tensioning force is transmitted to the net concrete section through its interface with the duct. However, the strands pile up pushing inside the duct producing vertical pressure components along an arc as well as the flattening out of the duct. The duct detaches then of the concrete leading to a crack initiation. This study presents a strongly non-linear model that attempts to account for all these factors. The results show that the concrete-duct contact must be modeled in order to prevent a crack sewing effect that may greatly overestimate the section capacity to withstand the posttensioning, not to say the mechanical and thermal service loads. It also shows that these structures require higher tensile concrete strengths, and UHPC and UHPFRC must be considered in order to make these tanks viable. 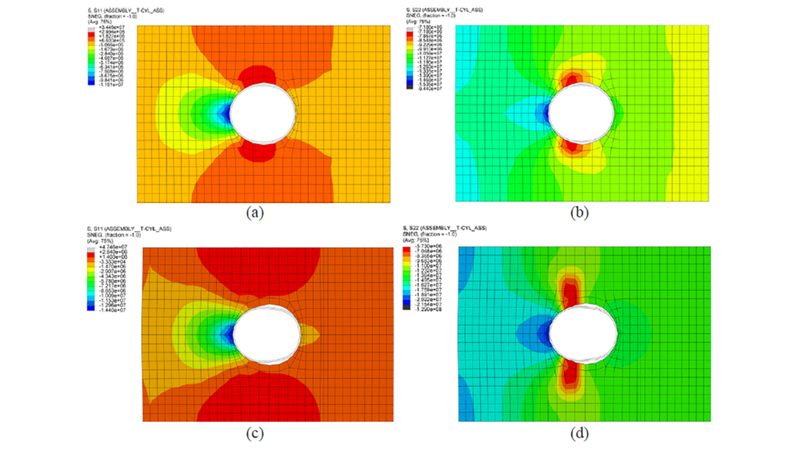 A model has been developed to describe the relevance of the duct-concrete contact interface properties in the evaluation of the post-tensioning capacity of these high-curvature concrete tanks. Three types of interactions have been defined in order to evaluate the sensitivity of the contact model: frictional, cohesive and full-bond. 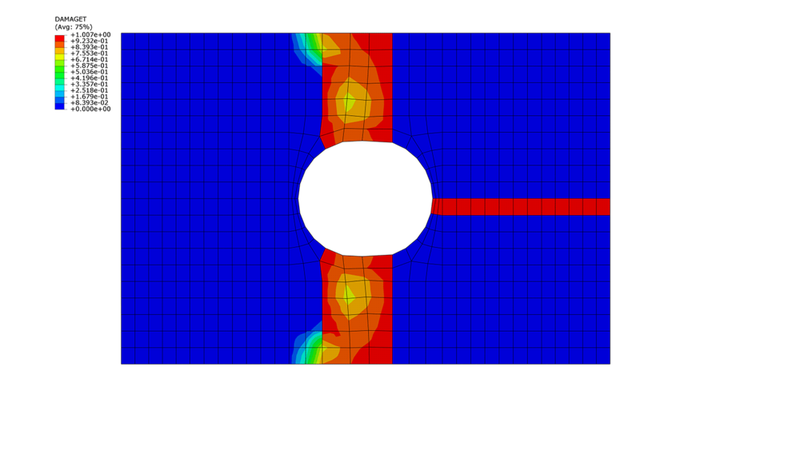 Results show that a significant limitation to the maximum post-tensioning force appears when separation of the duct from the concrete hole is allowed with respect to full-bond models. The multistrand effect causes that not only radial, but also vertical pressures are transmitted to the concrete by the duct. The duct flattening out alters also the progressive distribution of these pressures, and a cylindrical (vertical) crack initiates in the vicinities of the last strand contacting the duct directly. The effect of the reduction of concrete material strength and the deformations and stress level due to the non-uniform temperature distribution within a structural element such as a storage tank has a coupled negative effect on the post-tensioned concrete design. Heated strands embedded in a heated concrete element will elongate, hence, reducing the post-tensioning force. This reduction will reduce the confinement of concrete, which added to the temperature gradient derived tension results in a greater level of damage and cracking. This study sets up a strongly non-linear model that attempts to account for all these effects. The results show that cracking localization grows surrounding the tendon duct, producing a sharp decrease in the post-tensioning force and a significant reduction of global stiffness.